What an awesome opportunity to help another St. Michael first time home buyer! It was a pleasure to assist this home buyer in the purchase of their first home! Traditionally the Real Estate market has swayed towards a seller's market. However, if you're planning to purchase a home, the winter can make the home buying process a little easier as winter tends to shift the market more into a neutral state. This home was listed just a few days before we took a look at it. Fortunately for us no other offers where present so we were able to negotiate with the sellers directly without a multiple offer scenario like we typically see in the Spring. Multiple offers are where more than one buyer is presenting their offer to a seller. This can really be any amount of offers even 10 or more on a really hot property. The situation is typically handled by the seller giving all qualified buyer's the opportunity to give their highest and best offer, which is usually presented to the seller all at once with a specific deadline. The seller then will go through the pro's and con's of each offer presented and determine which offer will be chosen. 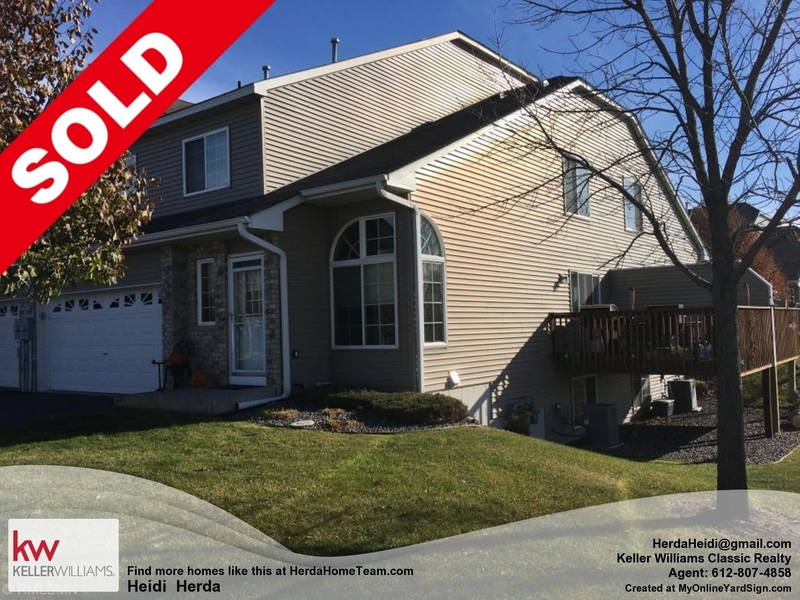 This St. Michael Home is now sold and Closed! Since we’re still in a hot market, this St. Michael home for sale actually sold in just 16 days! Our offer was chosen at listed price on this St. Michael home which was $182,500 the seller's also contributed $2,738 toward the buyer's closing costs. The buyer on this one also used Keller Mortgage which saved him over $4,000 in additional fees and closing costs, with The Zero Keller mortgage which doesn't charge origination fees and contributes $1,000 toward any 3rd party fees when the purchase price is over $150,000. In the state of Minnesota, it has been typical to ask the seller to make some contributions to the buyers closing costs in the form of concessions. Since the current market has low inventory, buyers are competing more heavily to gain an accepted offer. This usually means that any closing costs the buyer needs would be added to the listed price of the home in order to ‘win’ the competition. This St. Michael homeowner was pleased with the offer that came in. They were wonderful to work with and the sale was a nice smooth transaction. This home is located in The Fields of St. Michael Homeowner's association. The St. Michael home for sale was an end-unit townhome with great private views off the deck. This property sold and closed on 1/11/2019 making this first time home buyer excited to get into the new home and make it their own! The number of active listings in SAINT MICHAEL (55376) increased by 16.3% from the previous month. The median number of days active properties have been listed is 53. This is significantly shorter than the national average. The number of sales in December dropped by 71.4% from the previous month. The current St. Michael market remains a neutral market. The demand for housing is currently meeting supply. St. Michael 55376 has 18 active properties, with many of them currently contingent on the inspection. Only 1.8% would be considered distressed. A distressed property would be either in short sale status, foreclosure/bank owned. This is an improved number of distressed properties that we have seen in the last several years. Median household income in 55376 is $106,699 with 208 households earning between $35,000 to $40,000 annually. For the zip 55376, 42.06% of the people have completed a bachelors degree as their highest education level. The median age of residents in St. Michael is 41, with 57% of residents being married. Current statistics suggest St. Michael has roughly 7,742 households, of those households 3,161 of them have children. Find all St. Michael Home listings. If you need more information about the St. Michael area you can visit my St. Michael community pages where you can find more information about local pricing, School information and more.